Commissioned by the American Dental Association (ADA), this 22-foot high structure was originally located in the eastern light well at the ADA headquarters on East Chicago Avenue, where it could be viewed from the 2nd floor as well as from the ground. An open-form soldered construction of Cor-Ten steel, the sculpture offers a number of different visual experiences, depending upon the viewer’s perspective. Herbert Ferber (1906-1991) was a natural choice for the commission, as he was a practicing dentist as well as a leader in the Abstract Expressionist movement in sculpture. Describing his approach to sculpture, Ferber explained: “The forms hold the space and the space holds the forms.” Rejecting naturalism and, over time, restricting his forms to lean, simple shapes, Ferber aimed to create structural environments that allow viewers to, potentially, move through the work. 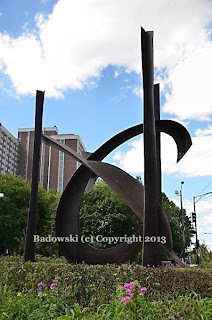 In 1992, not long after the artist’s death, the work was donated to the city of Chicago and it was moved to its current location. Although more available for public viewing, the spot alongside two busy streets is not ideal for studied consideration of the forms and the view from above has been completely lost.